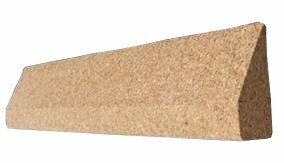 Home > Props > Blocks & Wedges > Cork Yoga Wedge 20" x 3.5" x 1.5"
Cork Yoga Wedge 20" x 3.5" x 1.5"
20" x 3.5" x 1.5"
This cork yoga wedge helps you go deeper into the stretch and maintain alignment. This versatile prop can be used under your heels when squatting, under your wrists during downward dog and other poses that put excessive pressure on your joints. The wedge is ideal for balance training, improving coordination, and overall posture stability. Get the most out of your stretch with a yoga wedge. I have issues with wrist pain in poses like plank, arm balances, wheel, etc. Using this cork wedge under my hands in such weight-bearing poses keeps my yoga practice pain-free! It is very firm, does not side around on my mat, and keeps my hands from sliding as well. However, I do wish it was longer; it is 4" shorter than the width of a standard yoga mat. This is a great prop for my students with wrist pain. A little lift helps them to be pain free during class as they build the necessary muscles. I have had painful wrists after doing down dogs and planks - I compensated by using fists instead of flat palm. It was suggested by a yoga instructor that I try the wedge. It seems to be doing the trick !